This is a collection of online resources for William Golding's classic Lord of the Flies. The novel has been a favourite choice for the Junior Certificate Studied Fiction section for many years. 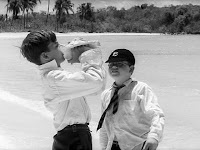 The novel is an allegorical tale (see video below) and it follows a group of young boys that crash land on a remote island. The boys form a society but it slowly becomes corrupted and fails. The resources start with an interactive online game that can be found at nobelprize.org. 2. Find the the entire novel here. 3. BBC GCSE Bitesize collection with notes, videos and tests. 4. Bookrags.com chapter summaries and notes. 5. A collection of pictures from a movie adaptation of Lord of the Flies. Ralph and Piggy try to bring order to the island.